Husky Corp. uses hydraulic clamping components from Carr Lane Roemheld to create fixtures with extremely compact sizes, and find they last for decades. 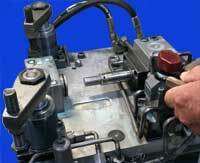 Time-tested workholding allows a parts manufacturer to target other areas for improvement, if needed. 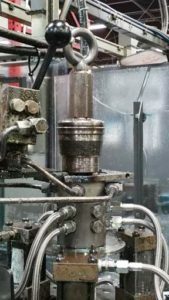 Husky Corp., for example, needed space-saving hydraulic components when refixturing a dial machine with limited space for fixtures and conducted an extensive search 30 years ago for a solution, said Darrell Vilmer, senior manufacturing engineer – machine/fixture designer for Husky. The search lead the Pacific, Mo., manufacturer of fuel dispensing equipment to hydraulic fixturing components from Carr Lane Roemheld Manufacturing Co., Fenton, Mo. 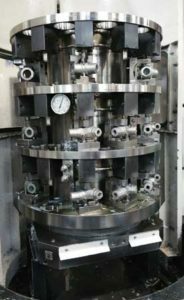 After achieving positive results with the first application, Vilmer said he employed the hydraulic components for column fixturing in a horizontal machining center and increased the number of locations for machining parts from six to nine. Besides minimizing component replacement cost, that level of durability also allows Vilmer to avoid the difficult task of replacing components in confined spaces, he noted. Founded in 1947, Husky Corporation is one of the world’s largest producers of fuel dispensing equipment. The company manufactures a variety of components, ranging from the nozzles that dispense gas into a vehicle to the swivels that allow movement of the hose, to the safe-t-breaks® that prevent the dispenser from getting pulled over in case there is a drive off. Headquartered in Pacific, Missouri (in the metro St. Louis area), with 130+ employees, Husky is committed to provide petroleum-dispensing products that meet or exceed customer expectations and reinforce the fact that Husky is a reliable partner that is with its valued clients every step of the way. 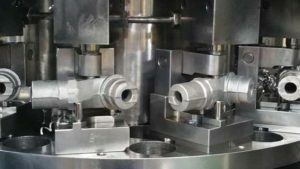 Husky’s primary decision makers in finding fixturing solutions were Darrell Vilmer, Husky’s Senior Manufacturing Engineer and machine/fixture designer, and Alan Siedhoff, VP of Manufacturing, and project approver. Vilmer and Siedhoff found Carr Lane Roemheld components to be very compact and highly efficient. The two primarily worked with David Vilcek, Carr Lane Roemheld’s Manager of Workholding and Assembly.